The Rockettes with their cardboard cutouts of the 10th Anniversary edition of O, The Oprah Magazine. When it comes to meeting celebrities, there is no one more famous, more beloved or who elicits more excitement (and more nervousness!) than former talk show host Oprah Winfrey. 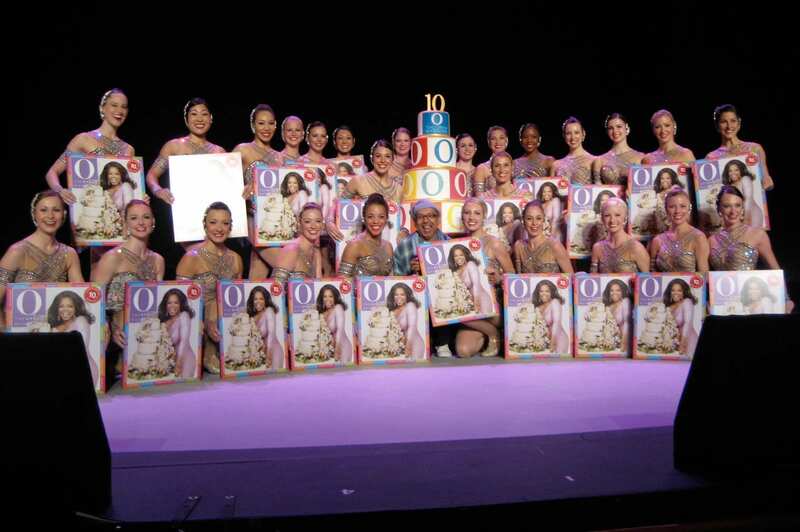 In May 2010, a handful of my Rockette sisters performed live at Radio City Music Hall in celebration of Oprah’s 10th Anniversary of O, The Oprah Magazine. Sarah (the middle one on the left) and her Rockette sisters posing alongside Oprah’s 4-tiered cake. During rehearsal, we did a kick line with giant cardboard cutouts—that would later be blown up as the cover of the 10th Anniversary magazine—to “New York, New York.” After our kick line and “reveal” of the cover, we flanked Oprah on either side while Hugh Jackman came out. Before Oprah made her grand entrance on stage with all the Rockettes, she chatted with us prior to the show. Of course she thanked me and my Rockette sisters for being a part of her special event, but she was quite the comedian! I remember her making a LOL-worthy comment about how she was walking around barefoot while rehearsing with us. But we totally get it—you have to be comfortable Oprah! Having the chance to meet Oprah (and make a grand entrance with her!) was one of the most memorable experiences I’ve had as a Rockette … and we even got to keep the giant cardboard cutout of the magazine cover! Sarah G. has been a Rockette since 2006. She currently resides in New York, NY.